We offer Vehicular Intercom System and complete range of accessories as follows. Please click on P/N for more details. 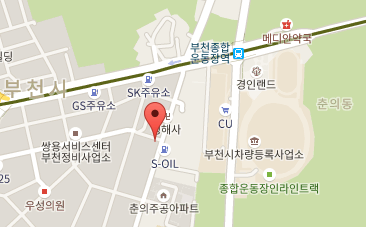 If you do not find any item on this page; Please contact us! AN/VIC-1 VEHICULAR INTERCOM SYSTEM The AN/VIC-1 Intercommunication Set provides voice communication between two to five vehicle crew members. It is used in those vehicles that do not have an intercommunication system as a part of a radio set. 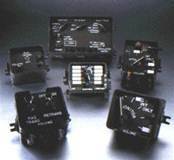 It consists of two major components: a Control Intercommunication Set C-2298/VRC is installed for each crew member who is to use the radio equipment (in a tank it is installed at each crew position except the drivers'), and an Amplifier, Audio Frequency, AM-1780/VRC, which amplifies the voice signals and controls their distribution throughout the system. Installation kits provided for specific vehicles may include other control boxes and audio accessories that are used in conjunction with the AN/VIC-1 Intercommunication Set. In addition, cable assembly, special purpose electrical CX-4720/VRC is used to connect the vehicular power supply to the amplifier and one CX-4723/VRC is used to connect the amplifier to each control box. While typically the AN/VIC-1 is used in vehicles, it may be used for non-vehicular installations when the correct DC power source is available. It has two line binding posts that may be used to connect a remotely located telephone or switchboard into the vehicular intercommunication system. AM-1780/VRC AUDIO AMPLIFIER is the main function box for the Intercommunication System. It has controls for both power/amplification. It provides connections between the amplifier and the crew members' audio accessories. It has a volume control and a radio/intercommunication selector switch. This unit amplifies intercom as well as received audio signals. It also functions as a main control box and an interconnection junction. As a control box it distributes power for intercom and radio operation, permits transmission by the commander or crew, and accentuates intercom audio to override the received signal. As a junction box, it interconnects the radio set and intercom system. C-2298/VRC INTERCOMMUNICATION CONTROL SET This box provides radio and intercom facilities for the commander or other personnel in the vehicle. A selector allows reception and transmission on any or all receiver-transmitters in the system. A volume control adjusts the audio level of intercom and received signals. C-2296/VRC INTERCOMMUNICATION SET CONTROL This box provides radio and intercom facilities to personnel outside the vehicle (through the C-2297/VRC). The unit includes a connector for a call indicator, and means to signal the C-2297/VRC operator. Handset H-207/VRC is supplied as part of the unit, and two terminals for a field telephone are provided. C-2297/VRC INTERCOMMUNICATION SET CONTROL This box provides radio and intercom facilities to a crew member. Its functions are similar to those of the C-2298/VRC, but it also serves as a junction box for the C-2296/VRC. The unit includes a call indicator and means to signal the C-2296/VRC operator. C-2299/VRC INTERCOMMUNICATION SET CONTROL This box is required in the radio sets AN/VRC-49 and AN/VRC-45 configurations to enable the two receiver-transmitters to perform automatic retransmission of signals at a relay radio site. In some installations it is provided as a convenient connection for audio accessories to control one receiver-transmitter. It is provided with controls and cable receptacles. C-2742/VRC INTERCOMMUNICATION SET CONTROL This box selects any one of the ten preset channels on automatic receiver-transmitter RT-246/VRC. It also remotely controls power applied to the RT-246/VRC, and selects RF output level. 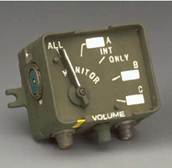 For greater versatility, two units of C-4724/VRC may be used in a military vehicle; each box obtains control of the receiver-transmitter by pressing a momentary switch. Two special lugs allow mounting above the C-2298/VRC. DH-132 SERIES HELMETS These Helmets are usually provided to each crew member as an integral part of the AN/VIC-1 intercom system.